Sinn Féin has launched its policy for older people, but not everyone is impressed. GERRY ADAMS IS hopeful he’ll be Taoiseach by the time Sinn Féin holds its Ard Fheis in April. “One is always hopeful, but not for personal ambition. We are hopeful that as a result of the work being done across the island by Sinn Féin that people will consider, given that the others have had their chance for decades, that a new way forward is possible. He said the speculation of recent weeks “will be clarified when people step into the polling booth”. Mary Lou McDonald denied claims Sinn Féin is trying to hijack the centenary of the Easter Rising for political gain. The party is set to hold its Ard Fheis in Dublin on 22 and 23 April, with Adams to deliver a televised address to the nation on the eve of the 100th anniversary of the Rising. He will give a live keynote address at the conclusion of the conference on RTÉ television on Saturday, 23 April. The Rising began on Easter Monday, 24 April 1916. Speaking at Leinster House today, McDonald told reporters the timing of the conference was “absolutely not” a cynical move. You might more properly say that having the Ard Fheiseanna run through January is a cynical attempt to grab a bit of attention in advance of an election, if you were to address that question to the other parties. “We will celebrate this centenary year fully and inclusively, and we celebrate it as Irish Republicans. And the weekend of our Ard Fheis will mark to the day, almost, the centenary of the Rising and of Easter Week. “It’s also a moment to take stock and to discuss and debate the Republic and the achievement of the objective and ideals of the Proclamation. Those that accuse us of trying to wipe their eye or to try to take possession of the legacy of the Rising, it seems it seems that’s only a concern for them this year. We have celebrated and commemorated Easter and everything that the Proclamation means single every year. 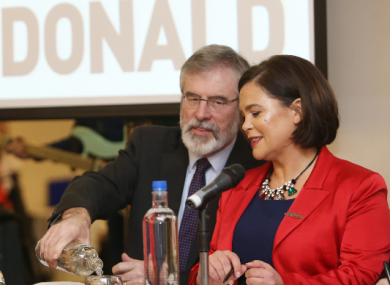 McDonald and Adams were speaking at the launch of Sinn Féin’s charter for older people. If elected, the party is proposing to recruit 550 gardaí a year; ensure there are no cuts to the state pension; and abolish property tax and water charges. Labour TD Derek Nolan described the charter as “a PR gimmick” and “a last-minute, desperate attempt to shore up support from a section of society they have completely ignored since 2011″. Unlike Sinn Fein, Labour are actually interested in investing in the elderly and in improving their living standards. We restored the Christmas bonus by 75% and increased the state pension. In its pre-Budget submission, Sinn Fein proposed nothing of the sort. “Labour are investing €940 million in the Fair Deal (nursing home) scheme this year so elderly people who need funding will be approved within four weeks. Again, Sinn Fein proposed nothing. Email “Gerry Adams is hopeful he'll be Taoiseach for the Easter Rising centenary”. Feedback on “Gerry Adams is hopeful he'll be Taoiseach for the Easter Rising centenary”.